Maybe Model Trains Aren’t Dying. It is not uncommon to read articles about how the model train industry is on the decline. Statistics commonly depict a dying hobby who’s users are aging and declining in number. NMRA articles often feature a president’s message looking for ways to bring young people to the hobby. Train shows are filled with rectangular layouts with elderly club members operating their locomotives safely from the center of the display (which often includes safety glass). But if you attended the Amherst train show in Springfield, MA last month, you may have seen something different. Young kids are downloading apps onto their smart phones and running trains themselves. Bachmann is the first major manufacturers to build Bluetooth Smart directly into their trains. Families with kids are downloading the free control app on their smart phones and running the trains themselves. The trains use the same technology found in the Apple Watch and Fitbits, and are a great example of refitting a classic hobby with cutting edge technology. This is accomplishing its goal of bringing younger users to the hobby. 35% of the people who’ve purchased Bachmann E-Z App™ trains since they released this Christmas are between the ages of 25-34, and 28% are between the ages of 18-24. These are young families with kids, and just the target audience the model railroading hobby is trying to reach. 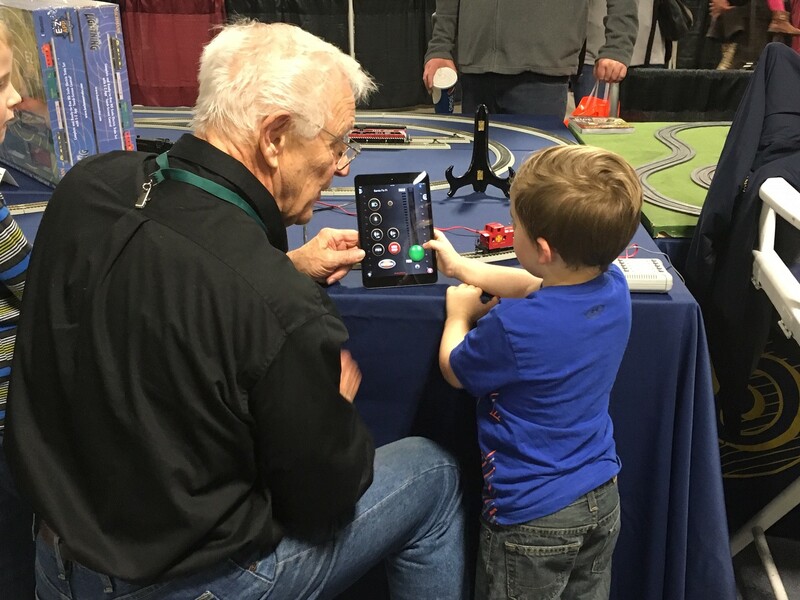 The photo at the top of this article (taken from the Amherst show) tells the story of an older model railroader handing the hobby to another younger generation. In this case, he is handing it over in the form of an iPad mini, and the child seems interested.